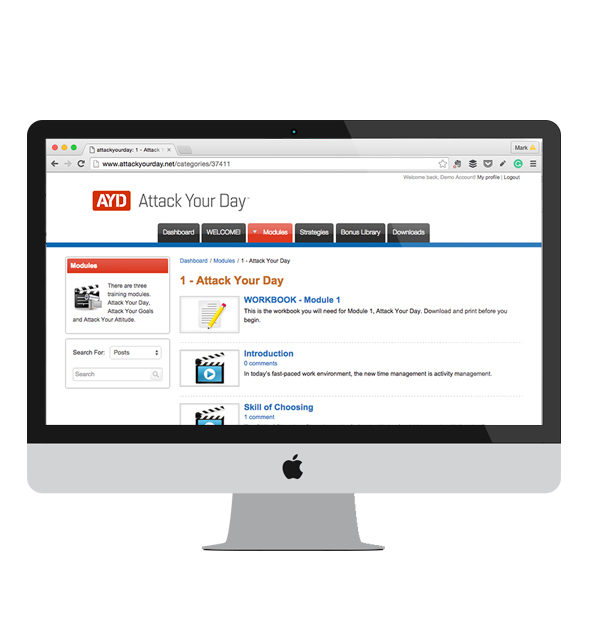 AYD OnDemand - Attack Your Day! Learn ridiculously easy skills to navigate time for greater productivity at your own pace for only $249 per person. In todayʼs fast paced work-life environment the new time management is activity management. Attack your day addresses five activity management skills that can be immediately applied to both your business and personal life. Get focused on goals, identify interruptions, work more efficiently, increase productivity, stress less and do away with overwhelm! Get good at 5 activity management skills and stress less, avoid overwhelm, and deal with interruptions so you can enjoy life. These skills include choosing, arranging, tracking, flexicuting, and focus and are essential to time management. Define, write, and achieve your desired results in life through the power of goals. In this module you will learn to channel your energy on the immediate and intermediate activities necessary to reach your long-range goals. Attitude is a choice. The attitude towards our daily activities can make the difference. Learn to change your mindset and attack your daily activities with a positive attitude to get the right things done. We’ll discuss the most popular 101 productivity strategies in the book so you can learn to quickly deal with email, distractions, focus, communication, meetings, and interruptions to increase your productivity.